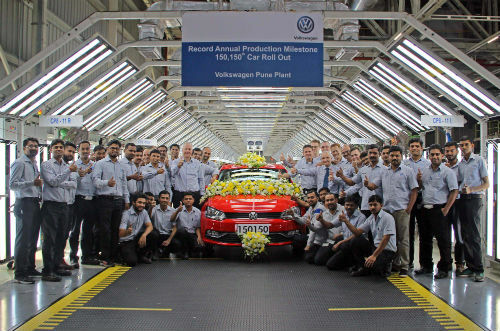 Pune: Registering a growth in production over the last year, Volkswagen India’s Pune Plant has now recorded its highest ever annual production since 2009. The plant has now witnessed a growth in production for the sixth year in running. The contribution towards the increased volumes comes from a combination of higher demand from the domestic as well as export markets where the cars ‘Made in India’ have been a success. The Volkswagen Pune Plant facility is the only German car manufacturing plant in India that covers the entire production process from pressing parts to final assembly.The plant manufactures a range of vehicles including Volkswagen Polo, Ameo, Vento and ŠKODA Rapid. In addition tothe cars, 1.5-litre and 2.0-litre diesel engines are also being assembled at the facility. The production for domestic volume for the year 2017reached over 57,000 units from Pune Plant for Volkswagen and ŠKODA combined. The production of export units which includes Volkswagen Polo and Vento stood at over 93,100 cars. Over all, the total number of cars rolled out of the plant has crossed 870,000 units. Volkswagen Pune Plant has so far attracted an investment of over € 825 million (₨ 5720 crore). The plant has achieved a localisation level of approximately 82% (without engines and transmissions). With a workforce of 3600 employees, the plant has been operating in three shifts since March 2016.